Variety Is The Spice Of Life, And Now You Can Choose From A Variety Of Quaker Chewy Granola Bars. 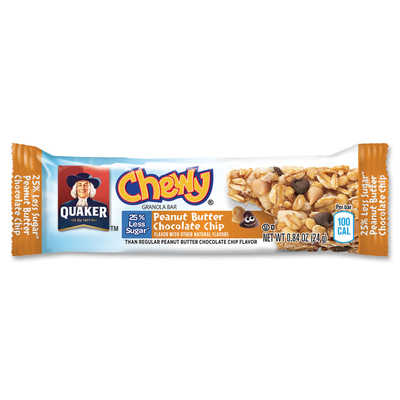 Variety Of Flavors Includes Chocolate Chip, Peanut Butter Chocolate Chip, S'Mores And Oatmeal Raisin Chewy Granola Bars. 8 Grams Of Whole Grains In Each Bar Deliver A Tasty Choice That Helps Keep You Going. Individually Wrapped Bars Are Perfect For Breakrooms, Your Desk Or Travel.. Variety Is The Spice Of Life, And Now You Can Choose From A Variety Of Quaker Chewy Granola Bars. Variety Of Flavors Includes Chocolate Chip, Peanut Butter Chocolate Chip, S'Mores And Oatmeal Raisin Chewy Granola Bars. 8 Grams Of Whole Grains In Each Bar Deliver A Tasty Choice That Helps Keep You Going. Individually Wrapped Bars Are Perfect For Breakrooms, Your Desk Or Travel.